The Holiday Inn Express Elkhart is an IHG Quality Performing Hotel located in the heart of Amish Country in Northern Indiana. Elkhart is also know as the RV Capital of the World. Located just north of downtown Elkhart, the Holiday Inn Express Elkhart is right off Interstate 80/90 (Indiana Toll Road) at Exit #92 (Indiana 19), one block west off of Indiana Highway 19 on North Pointe Blvd. The Holiday Inn Express Elkhart features 63 well appointed guest rooms including three suites. The Holiday Inn Express Elkhart also features free High Speed Internet Access in all guest rooms, an indoor swimming pool, hot tub and fitness room. Hot tub currently under maintenance. Our apologies for the inconvenience. Also enjoy our Express Start Breakfast Bar each morning. 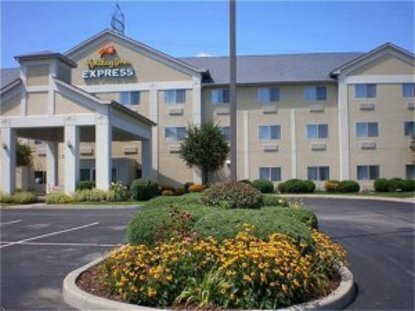 The Holiday Inn Express Elkhart is conveniently located near local companies such as Damon Corporation, Elkhart Products, Heywood Williams, Skyline, and Dexter Axle. The Holiday Inn Express Elkhart is also very convenient to Notre Dame University (20 miles), Shipshewana Flea Market and Auction(15 miles), R.V. Heritage Museum (5 miles), Amish Acres (22 miles), and within walking distance to over 15 restaurants and shopping outlets.Whether visiting Elkhart, Indiana for business or pleasure, the Holiday Inn Express Elkhart, located right off Interstate 80/90 (Indiana Toll Road), is your home away from home Welcome to the heart of Amish Country and the RV capital of the world This hotel is committed to providing accessible facilities under the American Disabilities Act. If your accessibility needs are not met, please contact the Hotel Manager on Duty. Should you require additional information regarding accessible facilities for guests with disabilities, please call 1-800-Holiday (U.S. and Canada) or contact the hotel directly. For the hearing impaired, TDD service is available at 1-800-238-5544 within the U.S. and Canada.